Put An End To Classroom Clatter With Chair Socks. 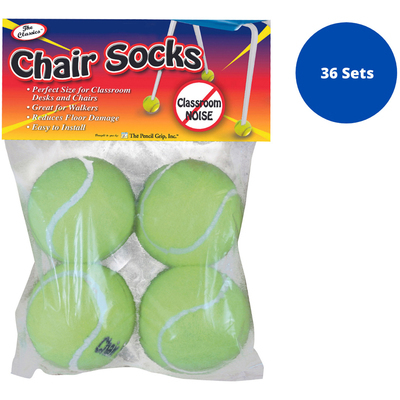 Eliminate The Distracting Noises Of Shuffling Chairs And Desks By Slipping These Handy Balls On The Chair Feet. They Fit All Standard Classroom-Style Chair And Desk Legs. Chair Socks Are Pre-Cut And Ready To Put On. Assembly Is Easy. No Tools Are Required. The Tops Have Slits In The Shape Of An X To Fit A Variety Of Diameters. Chair Socks Are Great For Use On Walkers Too.. Put An End To Classroom Clatter With Chair Socks. Eliminate The Distracting Noises Of Shuffling Chairs And Desks By Slipping These Handy Balls On The Chair Feet. They Fit All Standard Classroom-Style Chair And Desk Legs. Chair Socks Are Pre-Cut And Ready To Put On. Assembly Is Easy. No Tools Are Required. The Tops Have Slits In The Shape Of An X To Fit A Variety Of Diameters. Chair Socks Are Great For Use On Walkers Too.